The l.o.u.n.g.e. (Lounge Of Undefinably Numerous Goods and Electronics) is an environment intended to compress the maximum amount of groovitude into the minimum amount of space. Because such a project cannot afford to be compromised by members of the general populace who are unable to comprehend the awesomeness of such a room, the l.o.u.n.g.e. has been hidden inside of a crappy dorm on the West Campus of Georgia Tech. An overview of the technically complicated features of the l.o.u.n.g.e. can be found at the `control' page . The concept of the l.o.u.n.g.e. was first proposed in Spring 2006 during an intense session of the ritual known as "Procrastinate In The Dining Hall Instead Of Doing Homework", after it was announced that a room continually under blacklight would be "groovy". Plans were developed in quick succession. 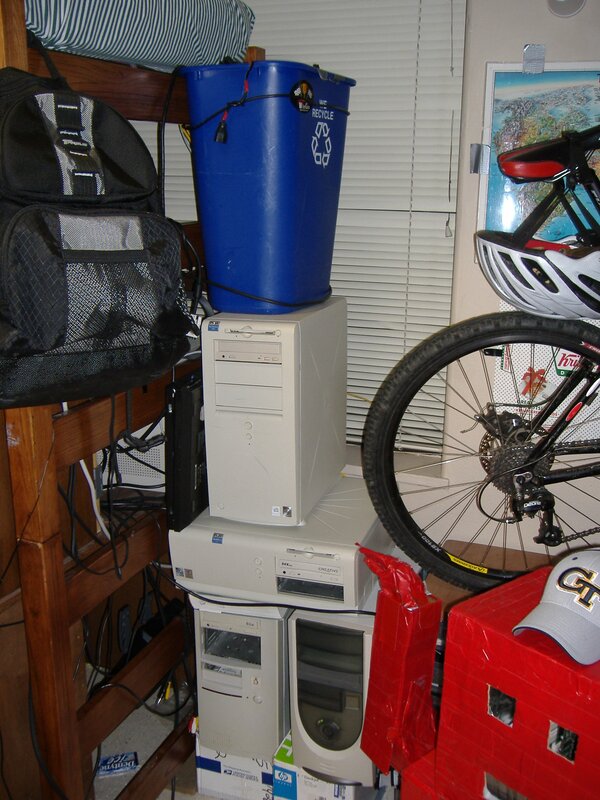 It was decided that multiple stacks of computers and electronics equipment were necessary, so that the room emitted the proper cyberpunk  aura. One source of inspiration for the design of the l.o.u.n.g.e. was a project at MIT, the MIDAS (Multifunction In-Dorm Automation System) . At this point in the design stage, a rudimentary stack of computers already existed (see Figure 2), though the l.o.u.n.g.e. was still only an idea. It was planned that this concept would be expanded upon heavily. Other proposed concepts included full-time darkness (to preserve the effect of the blacklight), a centralized music server with an inordinate number of speakers, and a centralized means to watch movies and other media. In Fall 2006, the l.o.u.n.g.e. was finally implemented in its first form . 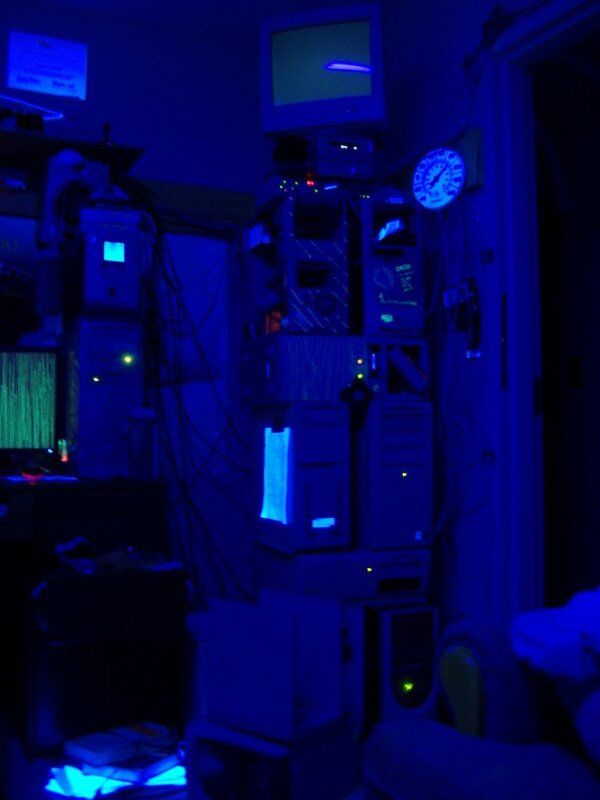 The blacklight was installed; windows were rendered ineffective with aluminum foil and electrical tape; approximately fifteen computers were organized into two main stacks. A large couch was obtained; it had been named "The Triple-Breasted Couch from Eroticon VI" by its previous owners, who were old Georgia Tech Band alumni. The couch exhibited several suspicious glowing stains when brought under blacklight; the pillows were therefore turned over. Also obtained was a 27" television requiring continual percussive maintenance, and three refrigerators of varying size. One of these refrigerators was intended to be a computer cluster of four nodes. 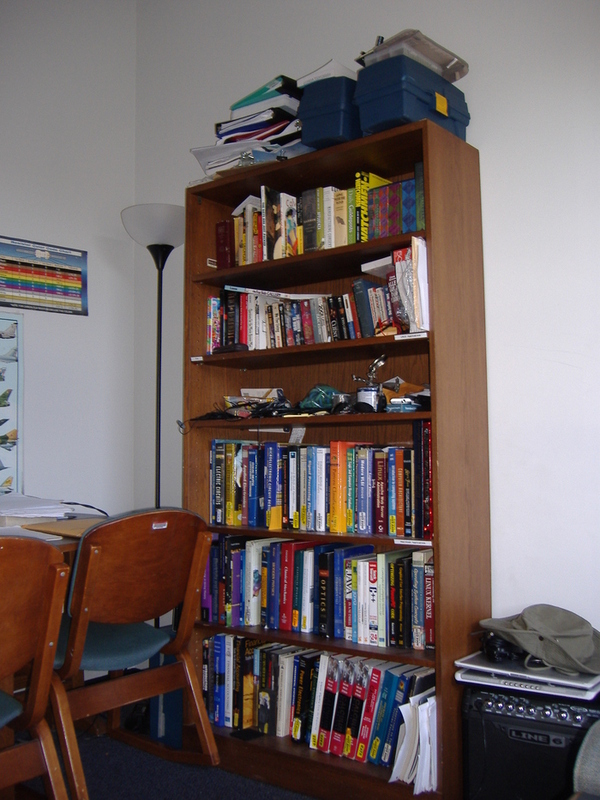 Shelves were constructed out of L-brackets and pegboard to hold the excessive electronics and goods. These shelves included a feature whereby items would be dropped onto the floor at random intervals. Figure 3 shows the setup of the early l.o.u.n.g.e. Figure 2. A nicely organized landfill. Figure 3. 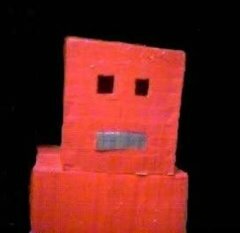 Archaic prototypism, later to be fully refined. 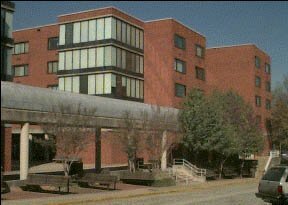 In August 2007, Georgia Tech Housing decided to carry out their plan of forcing the l.o.u.n.g.e. to relocate approximately 500 feet, from the 4th floor in the south wing of a building to the 5th floor on the north wing of the same building. During the process, the entire contents of the room were emptied onto the street. This debacle can be seen in Figure 4. Figure 4. Property theft waiting to happen. Later in 2007, the l.o.u.n.g.e. was re-established and improved upon . Numerous further electronics and goods were obtained, including an oscilloscope, a projector and 100-inch screen, and assorted miscellaneous electronic components. These new devices furthered the entertaining capabilities of the l.o.u.n.g.e., which, at that particular point in time, was able to house up to approximately sixteen guests comfortably for a movie viewing. Figure 5. A wake-up call for Neo. At the close of the 2007-2008 school year, the residents of the l.o.u.n.g.e. chose to re-establish the l.o.u.n.g.e in apartment-style housing. This new setup allowed a total of five rooms (as opposed to the previous two), which were used to the advantage of the groovitude of the l.o.u.n.g.e. . Among the additions were a couple new monitor and a record player. The five rooms also allowed for a dedicated study room. The new space allows up to approximately twenty guests comfortably for a movie viewing (as opposed to the old sixteen). Figure 6. The new dedicated study area, rarely used for studying. On to the 2006 l.o.u.n.g.e. !